TERRE HAUTE, Ind. 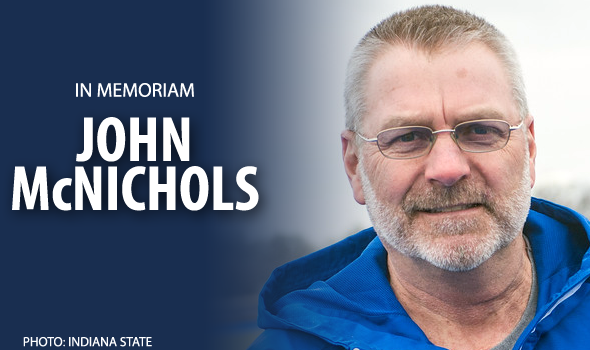 – John McNichols, the longest tenured coach of any sport in Indiana State University history with 34 years at the helm of the track & field and cross country programs, passed away Wednesday morning at the age of 66 due to complications from a stroke. McNichols had been attending the USTFCCCA Convention with the Indiana State coaching staff in Orlando last week, where he suffered the stroke on Saturday just before his return trip home to Terre Haute. McNichols was listed in critical condition as of that night and up until his death Wednesday morning. McNichols came to Indiana State in the fall of 1983 as a 33-year-old head coach and immediately sparked a revolution in cross country and track & field not only for the Sycamores, but for the Terre Haute community and the nation at large. In his time as the men’s head coach and in his 28 years as the program coordinator of the combined men’s and women’s program since 1989-90, McNichols helped guide the Sycamores to 38 total Missouri Valley Conference team championships with 11 in cross country (nine men, two women), 10 in indoor track (six women, four men) and 17 outdoor titles (10 men, seven women). McNichols’ reputation around the nation can be attributed to multiple superb accomplishments during his career, such as the mentoring of seven-time NCAA Champion Holli Hyche, or the installation of a hurdle dynasty at ISU with the likes of NCAA Champion Chris Lancaster and All-Americans Aubrey Herring, Greggmar Swift and Adarius Washington (a dynasty referred to by David Woods of the Indianapolis Star as “Hurdle U”), or the mentoring of the greatest cross country runner in the history of both the Missouri Valley Conference and the state of Indiana in All-American John Mascari. "We are certainly sad that the coaching community lost Coach McNichols,” said Sam Seemes, CEO of the U.S. Track & Field and Cross Country Coaches Association. “Our thoughts are with his family and to all of those his life touched. He fulfilled all the roles embodied in a coach – he was a teacher, mentor, and a person who served his institution and community well. Along with giving back to his athletes and the community, he gave back to the sports of track & field and cross country immensely. We will always be mindful of his lifelong dedication." His reputation extends even further with his community outreach and national positions in the track world. Here in Terre Haute alone McNichols oversaw the construction and development of what ended up as the nicest cross country course in the nation with the LaVern Gibson Championship Cross Country Course, host of 12 NCAA Championships and numerous other large meets that have hosted some of the world’s finest athletes. Most recently McNichols helped in the development of a brand new outdoor track facility for Indiana State, the Gibson Track & Field Complex right on the banks of the Wabash on the western edge of campus. In addition, McNichols was generous with his time and community service in regards to both Heritage Trail and Wabashiki Trail. Abroad, McNichols was known as one of the preeminent minds in the world of Olympic-level hurdling, serving as Hurdles Broad Event Chair from 2000-09 for USA Track & Field’s Men’s Development Committee. McNichols also had years of service as a meet official, working as an official at the 1984 Summer Olympic Games in Los Angeles, the 1987 Pan-American Games in Indianapolis and the 1988 U.S. Olympic Trials also in Indianapolis before earning the great honor of being the head meet official for the 1996 Summer Olympic Games in Atlanta. McNichols also served as a coach on the national stage many times throughout his storied career. Three separate times McNichols served as the head coach of the U.S. Men’s Junior Pan-Am team, most recently this past summer in 2016 in Poland. McNichols was also an assistant coach in charge of hurdles and sprints for the 2007 U.S. team for the Pan-American Games. In addition, McNichols was prominent in trying to improve and efficiently regulate the sports of track and cross country with his positions on national committees throughout his career. He was most recently the chair of the NCAA Rules Committee, but he also served time on the NCAA Division I Track & Field Subcommittee. McNichols belongs to both the Indiana Track & Cross Country Hall of Fame (2007) and the Drake Relays Coaching Hall of Fame (2008). “John and I started working together at Indiana State in 1988,” said longtime women’s head coach and close friend John Gartland. “He had been the head men’s coach since 1983. Our goal was to combine the programs to use our coaching resources and strengths in a more efficient way. When we started working together, I realized right away what a good coach he was, but what I didn’t realize right away was what a good human being he was. He was tough but always fair to the athletes. He was totally dedicated to his family, even with the stress and time constraints of coaching. He took great pride in attending his children’s activities – and later his grandchildren’s events. He logged a lot of soccer spectating time. McNichols was born Aug. 28, 1950, in St. Charles, Iowa. He enrolled at Indiana University in the fall of 1968 on a track scholarship as a hurdler before graduating in 1972 with his bachelor’s and again in 1977 with his master’s. McNichols and his wife, Linda, were married on Dec. 20, 1970, during his junior year at IU. John and Linda went on to have three children: Matthew John, 42, Rachael, 37, and Mary Jane (Janie) Szabo, 36. McNichols was also a grandfather to eight grandchildren: John Gabriel, 16, Emilee, 11, Maya, 11, Macy, 9, Blake, 8, Lydia, 5, Drew, 4 and Landon John, 2. A local visitation will be held, with more information available in the coming days.